As a warming world moves from fossil fuels toward renewable solar and wind energy, industrial forecasts predict an insatiable need for battery farms to store power and provide electricity when the sky is dark and the air is still. Against that backdrop, Stanford researchers have developed a sodium-based battery that can store the same amount of energy as a state-of-the-art lithium ion, at substantially lower cost. Chemical engineer Zhenan Bao and her faculty collaborators, materials scientists Yi Cui and William Chueh, aren't the first researchers to design a sodium ion battery. But they believe the approach they describe in an Oct. 9 Nature Energy paper has the price and performance characteristics to create a sodium ion battery costing less than 80 percent of a lithium ion battery with the same storage capacity. "Nothing may ever surpass lithium in performance," Bao said. "But lithium is so rare and costly that we need to develop high-performance but low-cost batteries based on abundant elements like sodium." With materials constituting about one-quarter of a battery's price, the cost of lithium – about $15,000 a ton to mine and refine – looms large. That's why the Stanford team is basing its battery on widely available sodium-based electrode material that costs just $150 a ton. This sodium-based electrode has a chemical makeup common to all salts: It has a positively charged ion – sodium – joined to a negatively charged ion. In table salt, chloride is the positive partner, but in the Stanford battery a sodium ion binds to a compound known as myo-inositol. Unlike the chloride in table salt, myo-inositol is not a household word. But it is a household product, found in baby formula and derived from rice bran or from a liquid byproduct of the process used to mill corn. Crucial to the idea of lowering the cost of battery materials, myo-inositol is an abundant organic compound familiar to industry. 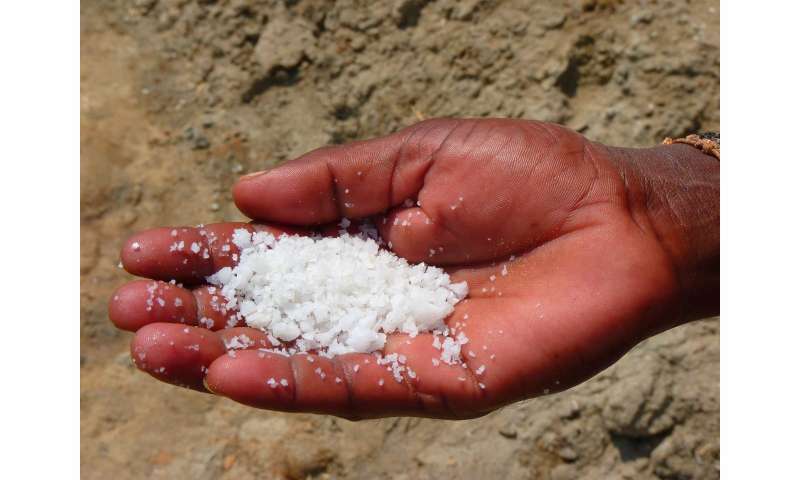 The sodium salt makes up the cathode, which is the pole of the battery that stores electrons. The battery's internal chemistry shuttles those electrons toward the anode, which in this case is made up of phosphorous. The more efficiently the cathode shuttles those electrons toward and backward versus the anode, the better the battery works. For this prototype, postdoctoral scholar Min Ah Lee and the Stanford team improved how sodium and myo-inositol enable that electron flow, significantly boosting the performance of this sodium ion battery over previous attempts. The researchers focused mainly on the favorable cost-performance comparisons between their sodium ion battery and state of the art lithium. In the future they'll have to look at volumetric energy density – how big must a sodium ion battery be to store the same energy as a lithium ion system. In addition, the team optimized their battery's charge-recharge cycle – how efficiently the battery stores electricity coming in from a rooftop solar array, for instance, and how effectively it delivers such stored power to, say, run the house lights at night. To better understand the atomic-level forces at play during this process, postdoctoral scholar Jihyun Hong and graduate student Kipil Lim worked with Chueh and Michael Toney, a scientist with the SLAC National Accelerator Laboratory. They studied precisely how the sodium ions attach and detach from the cathode, an insight that helped improve their overall battery design and performance. The Stanford researchers believe their Nature Energy paper demonstrates that sodium-based batteries can be cost-effective alternatives to lithium-based batteries. Having already optimized the cathode and charging cycle, the researchers plan to focus next on tweaking the anode of their sodium ion battery. "This is already a good design, but we are confident that it can be improved by further optimizing the phosphorus anode," said Cui. What About Sugar Based AND Chilli Powder Based Batteries ? If the cost for lithium is $15K/ton and sodium $150/ton, wouldn't the number be 80 percent LESS rather than 80 percent OF the cost of Lithium batteries? More like 1/5th the cost of lithium? Yeah, there's some shaky math there; $15k/ton for lithium vs. $150/ton for sodium comes out to 1/100 the processing cost and, by extension, 99% less to produce the sodium based battery --I suspect a lack of proof-reading is responsible unless there's something about the sodium battery's construction that wasn't mentioned which offsets the material cost savings. Interesting article and awesome if the research proves out but...erm....take it with grain of **cough** salt. With materials constituting about one-quarter of a battery's price,.. This battery may be as prone to severe fire as w have seen with lithium batteries. Sodium metal burns and so does the phosphorus part. But aren't they just talking about plain sodium, not sodium metals? "... but in the Stanford battery a sodium ion binds to a compound known as myo-inositol. Unlike the chloride in table salt, myo-inositol is not a household word. But it is a household product, found in baby formula and derived from rice bran...:"
The sodium is bound to an organic compound, myo-inositol. Organic compounds generally have weaker bonds than oxygen out of the air. The expected reaction would be oxidation of the organic material and the sodium to CO2, H2O and Na2O. The strength of this reaction would depend on the ignition temperature and the solvent used. No mention of water as the solvent, so perhaps it is an organic solvent. This battery may be as prone to severe fire as w have seen with lithium batteries. And yet we use lithium batteries all over the place (you probably have half a dozen or more in your household) without the world going up in flames. We use lithium batteries because these are the mature high power density devices we know how to make and because the production lines are set up including the supply sides for materials and distribution lines. To overcome this bump in the road to a different chemistry, not only must we get a better chemistry, but we must include start-up costs, marketing, "drop-in" replacement functions, distribution, which is formidable. Once an ecology was formed for lithium batteries, there was only two solutions: (1) A drop in replacement, (2) New equipment made for the new chemistry.